There are some things you just can't un-know. One of those things: how delicious and easy this dessert is. Even once you figure out that it's 500+ calories that you ate in less than five minutes because you don't want it to melt... you still want to eat at least one more. I generally find packaged ice cream sandwiches to be disappointing. The cookie is at least as hard as the ice cream, so it all smushes apart when you eat it. Plus, the cookie and the ice cream are usually subpar. My solution? Put together ice cream you already like and a cookie you already like. Leave it open-faced, and the ice cream doesn't smush as much. I got four coupons in the mail for free 2nd St. Creamery pints. 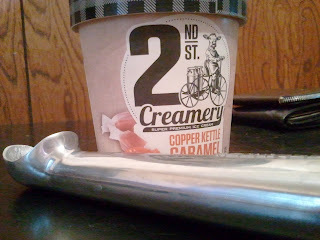 A better review of these will follow, but I picked the Copper Kettle Caramel flavor to make the snack with. This went on top of HyVee chocolate chip cookies that were an impulse buy because they were on sale and I was starving. Does anyone else pick up a snack at the store sometimes and then eat it on the car? Anyone? Anyone? Well, I ate mine, sat down to blog, and realized I didn't take a pic of the final product. Surely you can imagine a cookie upside-down with ice cream on it, right? Because I ate two of these yesterday and one today, and my clothes won't hold my tummy if I make another one already. What cookies and ice cream would you do this with?